Inder Loves Folk Art: Hi Margaret Joy! Apparently I had reason to feel nesty on Saturday, because baby girl decided to grace us with her presence a couple weeks early! Margaret Joy (named for my two grandmothers) was born this morning at 9:17 a.m., weighing 7 pounds, 1 ounce, and measuring 19 inches long. What a happy surprise! My labor was fast and smooth. Maggie was born only two hours after we arrived at the hospital (and when I arrived, my contractions were still pretty manageable). Labor came on very strong, and was very intense, but it was over so fast, I didn't have time to get discouraged or exhausted. Maggie came out pink and crying, there were no complications, and I'm feeling great (and yes, a little bit proud of myself)! And now I'm going to try to get some rest. Cheers everyone! P.S. She's a Cancer but her rising sign is Leo. She is so beautiful! Congrats! Wishing you all the rest you can get! Congratulations!!! What a beautiful little girl! Oh my goodness! Congratulations! What a wonderful surprise opening up my reader tonight! Glad it went so smoothly! I can't wait to hear what Joe thinks! Enjoy! What a beautiful little girl! Congratulations, and welcome to the world, Maggie! Wow congrats! She looks so peaceful. Rest up! ohhh congratulations, inder and family! she's a beautiful little gal and that's the best kind of birth story, too! you're definitely entitled to some feelings of pride - you earned them! enjoy those newborn snuggles and take care. Everyone at singing had big smiles and greeting for you and Maggie! Hope you're both resting well tonight and can't wait to see you home. Hugs and kisses from us to you! And, you send ripples of fear down my belly... early? That will just NOT work with my planned repeat c in 6 weeks! Just more of a reason to work on getting all of my sewing and house fixing done! Now! Enjoy your little girl... and, Margaret was on our short list of names, too! Yeah, I really did not see this coming! Surprise! :-) Of course, if I had needed a c-section, there would have been plenty of time for that, though, it wasn't *that* fast. Hope you have a peaceful planned delivery, right on schedule! She is so gorgeous--and she looks so much like her big brother! We can't wait to meet her. My little one asked if we could stay home from school tomorrow and meet the baby. Sigh. Honey, it's too far away to go tomorrow! But soon! Congratulations!! 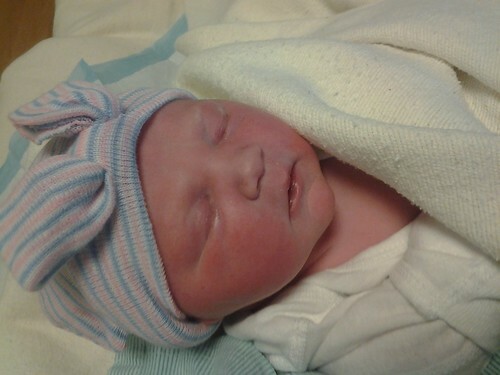 Welcome Maggie Joy! What a great name and she is just precious. Glad everything went smoothly. Oh my goodness... I looked away and you went and had a baby! Congratulations on your beautiful girl and smooth labor! Congratulations! She is so beautiful... And you should be proud! Get as much rest as possible as you enjoy your little one. How is Joe adjusting to big brother status? And I may be a bit biased since Margaret is my middle name, but what a lovely name! Oh, my -- what a peach! Margaret is my favourite name for a girl. It was my grandmother's name too: well, Margarete. So did she have a mullet, after all?